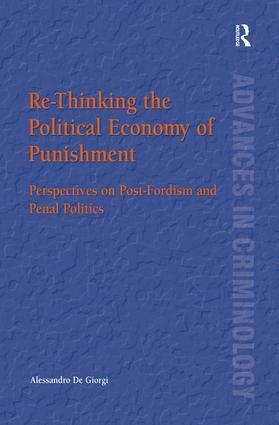 The political economy of punishment suggests that the evolution of punitive systems should be connected to the transformations of capitalist economies: in this respect, each 'mode of production' knows its peculiar 'modes of punishment'. However, global processes of transformation have revolutionized industrial capitalism since the early 1970s, thus configuring a post-Fordist system of production. In this book, the author investigates the emergence of a new flexible labour force in contemporary Western societies. Current penal politics can be seen as part of a broader project to control this labour force, with far-reaching effects on the role of the prison and punitive strategies in general. Contents: Introduction; The political economy of penality and the sociology of punishment - past and present; Post-Fordism and the emergence of the multitude; The government of surplus - preliminary incursions in the field of post-Fordist social control; Mass confinement and actuarial penology; The criminalization of international migrations - toward an actuarial model of control; Conclusion; Bibliography; Index. Alessandro De Giorgi has a PhD in Criminology from Keele University, UK. He is a researcher in Criminology in the Faculty of Law at the University of Bologna, Italy. His main research interests are in global migrations and the political economy of social control in contemporary societies.